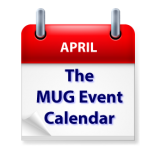 March gets off to a fast start with a wide range of great tech topics on The MUG Event Calendar. A Florida group will discuss Apple’s CarPlay, and the blockchain and cryptocurrency in commerce will be covered in Connecticut. 1Password will be the focus at a California group, and a Nevada group will discuss the ever-popular cutting the cord.